The assembled result looks like this. 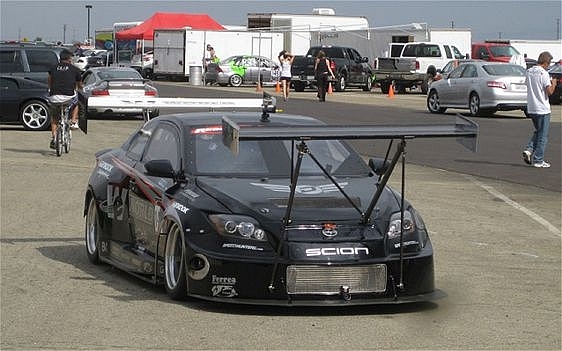 How wide is the car with the winglets inserted? Pretty damn wide. I seem to remember the team having to remove the winglets before bringing the car into the garage. While the car could go in and out of the garage with the winglets in place, it was a whole lot easier with them removed I bet. Pretty crazy looking, but it works. Of course I'd have to add that the MCA's implementation of a front wing is a bit more elegant than one of Chris Rado's front wings. See what I mean? While Rado's front wing may be effective, there's no denying it's a bit out of place. 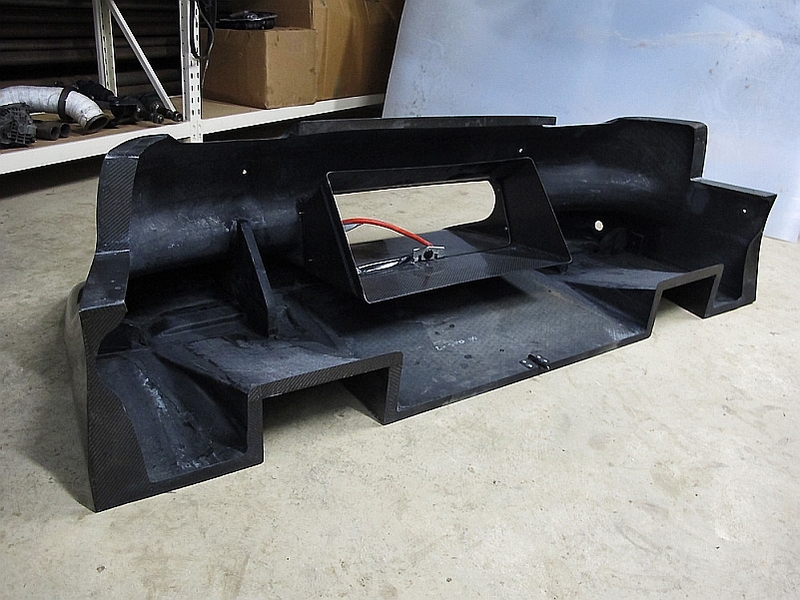 Here's what the inside of the front nose assembly looks like. 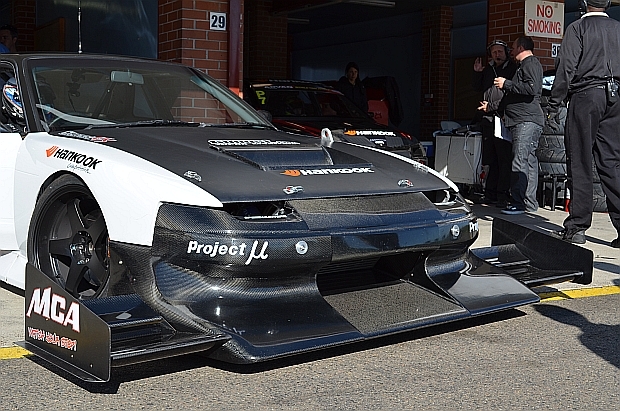 The front diffusers have an aggressive angle on them. This bumper is very stiff considering it's light weight. With the nose, belly pan and diffuser on the car, the bottom of the car is absolutely flat. Here Barry Lock studies the bottom side of the car and is probably wondering how the hell he is going to get it to all work together. 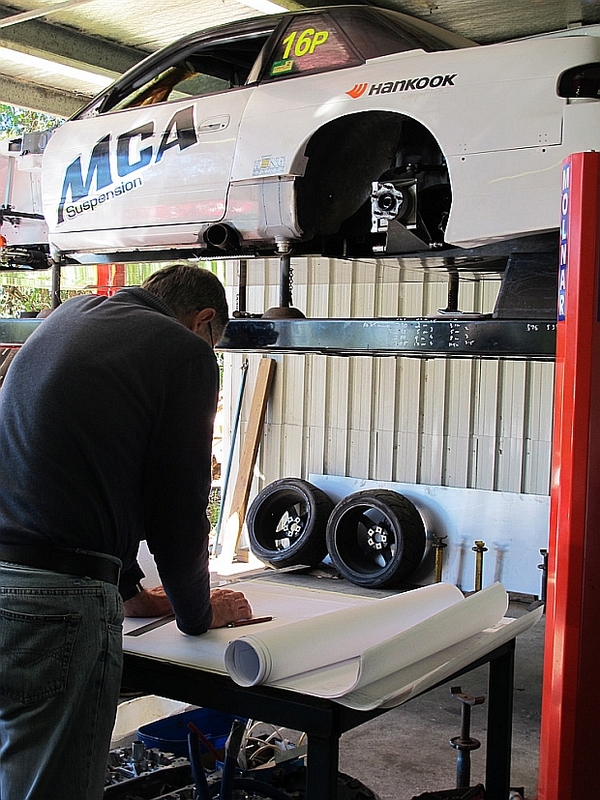 Packaging race style car aero on a production unibody car is very difficult and requires all aspects of the car to be designed together. Here Locke is in the process of redesigning the aero for 2012. Check out the mechanical pencil and vellum paper! There's certainly nothing wrong with drawing designs the old school way. The only shortcoming of not modelling the aero in CAD would be a lack of the ability to do CFD analysis. Experience and empirical testing can go a long way too though. As with many things, there's more than one way to skin a cat. Notice that the 3″ exhaust sits entirely within the chassis. Also notice the cutout for the air jack. 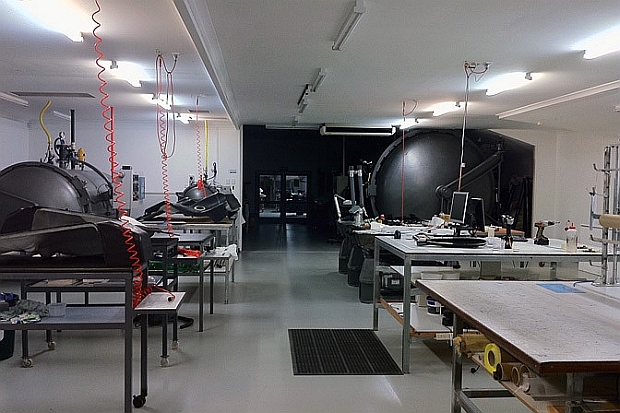 All of the carbon fiber was made at Lightning Composites in Queensland, Australia. 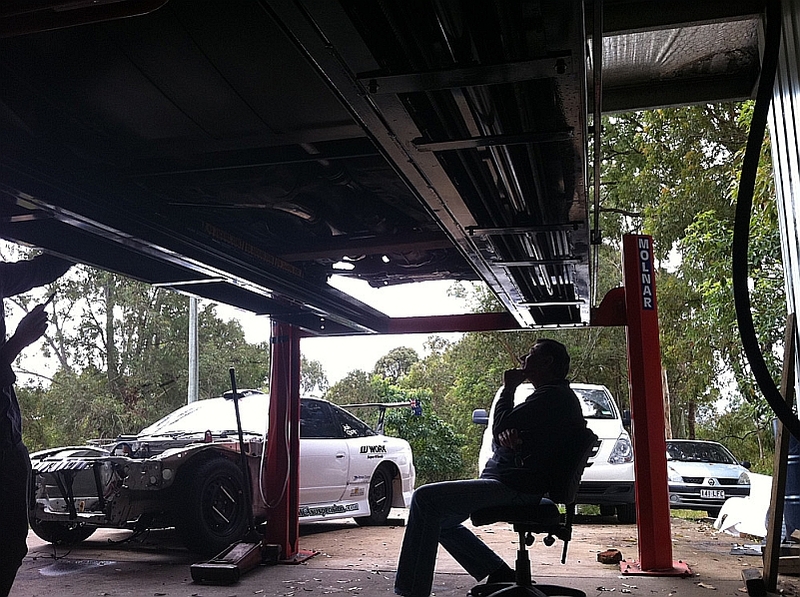 Lightning is one of the premier carbon fiber shops in Australia making parts for all kinds of racing in the Australian motorsports industry. Those giant cylinders you see are autoclaves which are essentially large ovens that double as pressurized vessels. Carbon parts made in autoclaves are made with “prepreg” carbon or carbon fiber cloth that is pre-impregnated with a high quality heat activated epoxy resin. Using prepreg carbon cloth ensures the perfect amount of resin in each part. The high pressure and high heat enables the parts to form on high strength tools that ensure the parts cure to exact dimensions. 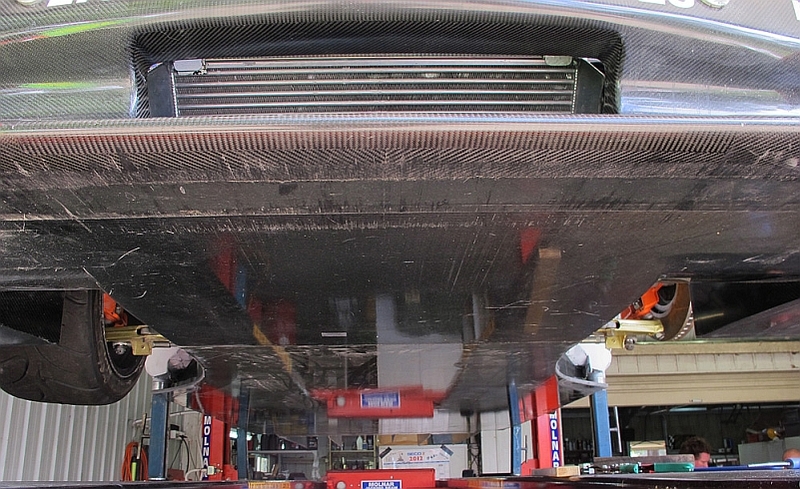 This manufacturing process is what makes “dry” carbon parts superior to “wet” carbon parts. Wet carbon parts are laid out against a simple mold (really just a shape), resin is brushed on these parts, and the parts are then allowed to cure at room temperature making wet carbon parts heavier because they have a lot more resin than is actually necessary.